I've finally done it. I've changed my name and I am officially and legally now Mrs. Kayla Whitter! Changing my name on my social security card and my driver's license was surprisingly, the easiest piece of the puzzle. It's the changing of the name everywhere else that took so long! It's the most dreaded part of becoming a newlywed: the name change. It's tedious, and stressful, and when is there actually time to do all of this? Here are some tips and a checklist that helped me get through it. First things first, you'll need to change your name with the Social Security Administration. This actually isn't as hard as it seems. You can do this by mail, but it's preferable to do in person, as they need the original copy of your marriage license. I found when I went, most people were there dealing with social security benefits, so I was able to go right back. The entire process only took about 10 minutes. I would recommend creating an online account with the Social Security Administration first, which will slightly speed up the process. I received my new card in the mail within a week. Next, you'll need to get a new driver's license. This one, you will have to do in person. You'll need your current driver's license and your certified marriage certificate. If your address has changed, you'll also need a piece of mail (like a utility bill) with your name and address on it. 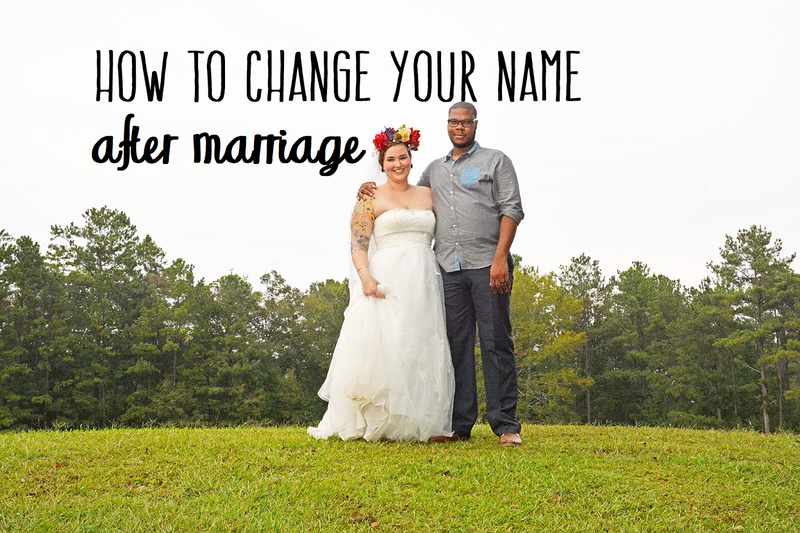 Now that you've changed the two most important things, here are some other places you may need to change your name, as well. Most places will need to see your certified marriage certificate and/or your new driver's license. Work. There may be several areas at work where you'll need to change your name. Most importantly, human resources, which will adjust your pay and benefits. You may also need to contact ITS for any email or phone updates or to update any access information. Additionally, if you have an id or name badge, you'll need to update that as well. Banks or credit cards. Generally, you should be able to update your credit card over the phone, but you may need to visit a branch of your bank to update your bank account. Additionally, you may want to look into acquiring a joint account, as well. Depending on your bank or credit card company, you may be charged for a new debit/credit card with your updated name. Utilities. This may include electric, gas, internet, cell or home phone, water, and more. Several of these places may require you to stop by in-person to update your information. Car title, car tag/registration, and car insurance. If you're financing your car, you may need to contact the lienholder, or who you're making payments to. As for insurance, you may need to update with your new husband's information. Doctor's offices. This should be okay to update at your next doctor's visit, as they usually ask if any information has been updated since your last visit. Social media accounts, such as Facebook, Twitter, Instagram, LinkedIn, etc. Any other accounts you may have. Luckily, most places updated my information for free. The only place I ended up paying anything was for my new debit card. So, good luck and congratulations on your new marriage! I did as many of these as possible without having to request off work. I was able to go to the Social Security Administration one day during lunch, and to the DMV after work one day (my local office is open until 6:00 pm). Most other places it was too difficult to schedule, so I took a half-day at work to finish up any additional name changes.